Your front porch makes a statement to everyone who visits your home. If your front porch is not saying what you wish it would about your home, it is time to call Anglin’s Foundation & Masonry Repairs. 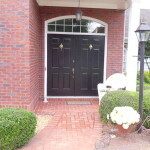 There is a variety of issues that can occur to the front porch stairs and/or stoop of your home. If you notice cracks in the concrete, the stoop pulling away from your home, the stairs sinking or settling, or an unstable structure that is difficult to walk on, it is time to call in the foundational experts. Any and all of these problems pose not only danger to your family members but also to anyone who visits your home. These issues can also significantly lower the value of your home because any type of settling or cracking at the front stairs or stoop signify that your home’s foundation is failing. Other signs that you may have noticed but did not piece together with your front stairs or stoop that also indicate foundational problems include: wall cracks, floor cracks, sloped or uneven floors, windows or doors that stick, or cracks in your basement. Most causes of front porch stair and stoop problems are a result of foundational issues of the home that are caused by soil movement below the home itself. If the foundation of your home settles, it will cause shifting in every aspect of your home. Because the front steps and stoop are generally built as an addition to the home, if the home’s foundation settles it will pull away from any “add on” structure. Foundation settlement is typically a result of changes in the moisture content of the soil, poorly compacted soil, sinkholes, or expandable clay (think Georgia Red Clay). Anglin’s Foundation & Masonry Repairs offers exceptional front porch stair and stoop repair to homes and property here in Metro Atlanta. For repairs related to a settling foundation, foundation piers can be installed to support the foundation. These piers are installed deep beneath the ground until they reach stable soils, and they will lift the structure back to its original position. All solutions are based on specific issues and problems related to each individual home or property. Anglin’s Foundation & Masonry Repairs will keep your home safe by repairing your front porch stair and stoop problems. If you notice any settling or cracking in your home – your front porch, your garage, your basement, your interior walls – please contact Anglin’s Foundation & Masonry Repairs right away. The sooner your issues are addressed, the sooner your safety is reestablished and the less money you will spend repairing damage. Call us today.